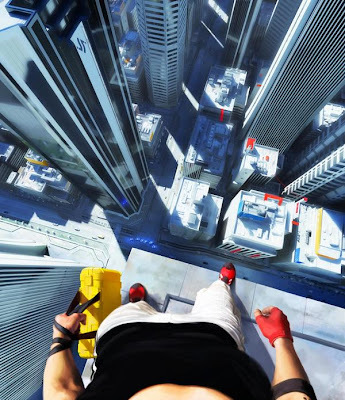 Mirror's Edge is a curious case: the game that gets exactly one thing right. I may have spent some time in the past prattling on about the idea of a Gesamtkuntswerk, but the bald truth is that in most circumstances a video game can get by, critically speaking, through dogged adherence to just one successful gameplay concept. Take Crackdown. That game has almost nothing going for it: no narrative to speak of, a charmless and weirdly depopulated open world, janky driving, mediocre graphics etc etc. But then, there is the jumping around on buildings and shooting. That is all it takes, folks. The cardinal achievement of Mirror's Edge is how effectively it creates the feeling of inhabiting a fleet human skull, rather than a steadicam. While so many first-person games give this dogged feeling that the smooth arc of a camera boom is being made to simulate animal locomotion, Mirror's Edge just nails the feeling of momentum, the sensation of weight in your movements, the subtle but increasingly palpable bob of the head as you gain speed. First-person platforming has been attempted before, and effectively at that (remember Jumping Flash? 'course you do! ), but it's never been done in a way that does justice to the particularities of embodied vision. Mirror's Edge shines in these small gestures towards perceptual realism: the way the world swirls around your head when you make a tumbling landing, the way it swims in front of your eyes as you plummet to your death. To me, it is astonishing that the designers of Mirror's Edge apparently managed to mistake these core pleasures that their game offered. Prince of Persia's no-death mechanic (actually an unusually dense checkpointing system) was maligned at release for being a sop to the noobs, which it was, but it also had a positive function: the impossibility of failure incentivized throwing yourself headlong through the environment as fast as you could. Prince of Persia is most successful when you fell into a rhythm and were able to whip past the lush scenery in top gear. The heights of Mirror's Edge are even better: you're booking across the rooftops, looking around for the next legible piece of the environment, navigating the world at a such a terrific pace that you lose the habit of conscious reflection. While the path through its roofops are almost as linear as Persia's consistently funnelish pathways, your elevation and the breadth of your field of vision in Mirror's Edge lends a unique feeling of grandeur and freedom to the business of running and tumbling and losing the fuzz. Which all makes it, again, so baffling that the game's mechanics seem to actively deter you from falling into this insanely pleasurable flow. The “runner's vision” environmental color-coding is an excellent technique for making the environment instantly readable, but the platforming is too finicky to engage in without the prospect of failure. Chris Dahlen put it best: “I’d say that its core problem is that it looks like Rock Band 2 but plays like Mega Man 9; you want to settle in and enjoy the thrill, but imagine if Rock Band stopped the song every single time you hit a bum note.” While Prince of Persia was too generous, rewarding you if you jumped in the general direction of the next platform (which gave rise to the otherwise-curious comparison of the game to an extended quick-time event), Mirror's Edge is too exacting: lining up your jumps requires too much precision. (This is doubly the case when your destination is a vertical pipe or horizontal bar.) It's too hard to make the tricky jumps on your first try, which brings the game to a grinding halt; this turns the game into a frustrating trial-and-error affair and ruins the best aspects of its gameplay. As for the elements of the gameplay that do not directly involve running and jumping and shaking the fuzz, the less said the better. I think the game's Spartan visual aesthetic is praiseworthy, but the bleached fascism of the environments is so uniform that the individual spaces lose any feeling of specificity (the “shopping mall,” for example, looks like another deserted skyscraper atrium). The gameplay elements that are meant to modulate the basic platforming are atrocious: the combat is an abomination, an active deterrent to enjoyment. (I recommend the “easy” setting, which reduces, but does not eliminate, the frustrating interactions with law enforcement.) The narrative is forgettable and poorly delivered. Despite frequent stabs at variation (an absurdly simplistic battle with an enraged wrestler, a “sniper” mission, and a surprisingly uninteresting battle against a posse of fellow "runners. "), Mirror's Edge never succeeds in creating any satisfying variety in its gameplay. The level design deserves a special dishonorable mention: the spatial arrangement of the environments often makes it difficult to distinguish makeable jumps from impossible ones, and the “jumping puzzles” in the interior levels were uniformly tedious and unintuitive. All this is a shame, because Mirror's Edge is very close to being a fantastic video game. The failure of Mirror's Edge reminded me of an interview that Shigeru Miyamoto gave to Steven Totilo, in which he said the only revealing thing I've ever heard Miyamoto say about the craft of game design: “I liken it almost to cooking. There are certain elements of cooking where if you’re able to find a very delicious ingredient, all you have to do is put a little bit of salt on it. Then you cook it and it tastes amazing... chefs are more interested in finding the most delicious ingredients they can find and cooking those in a way that really highlights the inherent deliciousness of the ingredient. And that, I feel, is our job in game design.” To follow up on the analogy: the designers of Mirror's Edge drowned fresh sweet corn in the awful sauce. Maybe they'll get it right next time around.